FYI, I have removed the red double quote graphic from the <blockquote> element. The styling was nice when if the post has a giant block of text. However since the new design launched, I noticed there has been many cases where smaller blockquotes were used in a single post. The graphic in each small blockquote made the page very busy and distracting. I believe the removal of the graphic aids to better readability. I don't think there was any reason to do that; I'm really not in favor of this change. I liked the red quotes, as I think regular quotation marks don't really "bring out" the word or excerpt from the background, and in fact inhibit readability. Now we're going to have to start using them to properly note direct quotations. I don't think anybody complained about these red quote marks in proper blockquotes — we complained only about their use in POSSIBLE DUPLICATE, at the top of the page. Why can't just that be fixed? Can we get a border or background change to make the distinction between quoted and non-quoted easier to see? 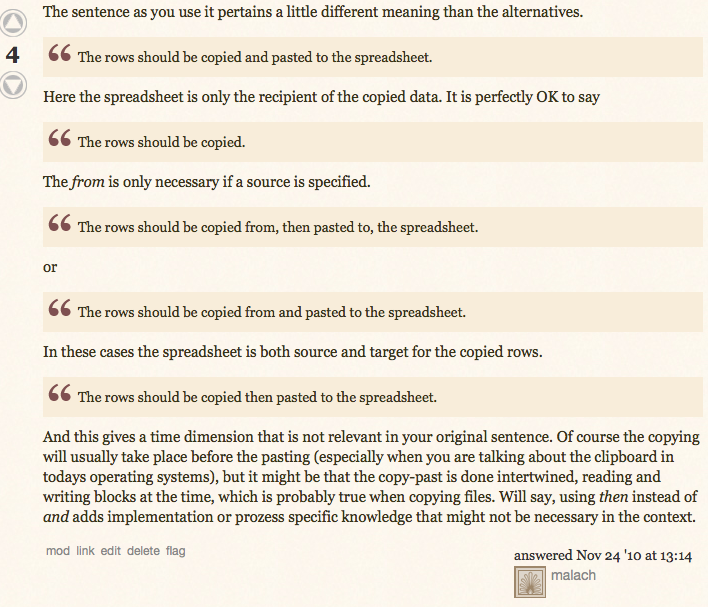 Not only were they often cluttersome, they were often just plain wrong, as when <blockquote> tags were used for things that weren't technically block quotes, such as the duplicate question message, and in many questions and answers, where often examples which are not really quotations are set off using <blockquote>, as in the example in the question here. The fact that they are indented is all the extra attention <blockquote>s need. The different background color is extra attention-drawing (which is fine) but certainly not necessary for the purpose of the tag. The giant quotation mark was way over the top, making <blockquote>s stand out too much, especially when there were several of them.